It is freeeeeezing in NZ just now and we all have the flu. How I WISH it was so hot I didn’t know what to do with myself… Because I WOULD know what to do with myself. I would definitely, without a doubt, go sledging. 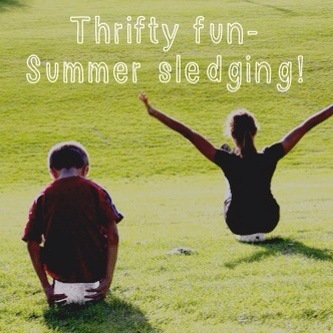 Summer sledging. It is the best free fun I have ever had on a summers evening and you only need a few things to make it happen. You need to freeze end water to sit on. We half filled ice cream containers with water for small bottoms and we used the vegetable tray from a fridge for larger bottoms. Filled it with about ten centimetres of water and then froze it ROCK SOLID in the deep freeze. We froze about seven slabs of ice altogether. Some of them we froze with a bit of rope in the front, to hold onto like a real sledge. Once they are frozen, hot foot it to the nearest hill and jump on board. Ridiculous, frenzied mayhem. I first did this with a bunch of young ‘uns when I was an 18 year old youth worker. What larrikins we were, with our blocks of ice. Fast and furious down the hill in the local park. I’ve never whooped so loudly. Stay cool out there, summer lovers.